You’re there! You made it! Now you can relax… almost. Checking in to your hotel can be a surprisingly deceptive event. On one hand you’re tired and just want to go to your room, on the other… no, you really just want to shower, take a nap then go explore. Either way, staying vigilant at the hotel can provide for a much safer, more enjoyable stay. If the front desk announces your room number, ask for a different room. Everyone in earshot now knows where your stuff is when you go out into town. 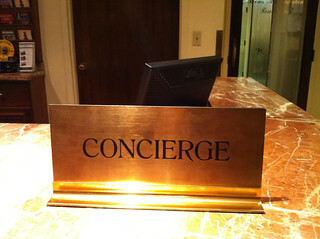 This is more important in crowded hotels with people hanging out in the lobbies. Never on the first floor: This applies to any hotel I stay in. First floor is way too accessible from the outside. Seventh floor and above? Depending on the country you’re in, they may not have a fire ladder long enough to get above the seventh floor. Gigantor room key-fob: You will often get a big and bulky key, which will tempt you to leave it at the front desk. Don’t leave the key at the desk when you head out for the day. Know where the exits are: Exit maps are usually posted on the walls. Look at the map, then physically check it out. If there’s an emergency you want to know not only how to get out of the building, but where you’ll end up once you’re out. Valuables: Out of sight is the best policy. Don’t advertise the goods. Most often the folks working at a hotel need the job badly enough that they wouldn’t dream of taking something that did not belong to them; however, that does not mean you should tempt them – especially in a poor country. The hotel safe: Don’t bother. Some places can pop the safe from the front desk. I put Cliff bars in there or underwear just to maximize space. Safe alternative? PacSafe Travelsafe with padlock, not key. Hook it to a pipe in the bathroom or other immobile object. Passport: They will ask for your passport to make a copy and tourist info, this is normal. I NEVER let them keep the passport overnight or while I’m out. Have a rule that makes your hotel stay safer? If you found this helpful, sign up for more advice and blog updates, direct to your inbox! Have You Insured Your Trip? © 2019 Travel Safer LLC.